25258 stands at Saltley on a fine Sunday morning during October 1976. The eighteen year eleven month career of D7608/25258 saw allocations to Eastern, Scottish & London Midland Region depots. Time between last Classified repair and withdrawal: 92 months. 25258 was the 228th Class 25 withdrawn, one of two withdrawn during December 1984. 25258 was stored at Carlisle Kingmoor from December 1984 until April 3rd 1985 when it was moved to Swindon Works, being broken up there during the first week of February 1986. Movement: 25140, 25239/258 were moved Carlisle – Bescot – Swindon during March 20th – April 3rd picking up 08599 at Bescot. Noted Derby Works March - April 1977 (Classified Repair). Noted Derby Works November 1980 (N6 repairs). 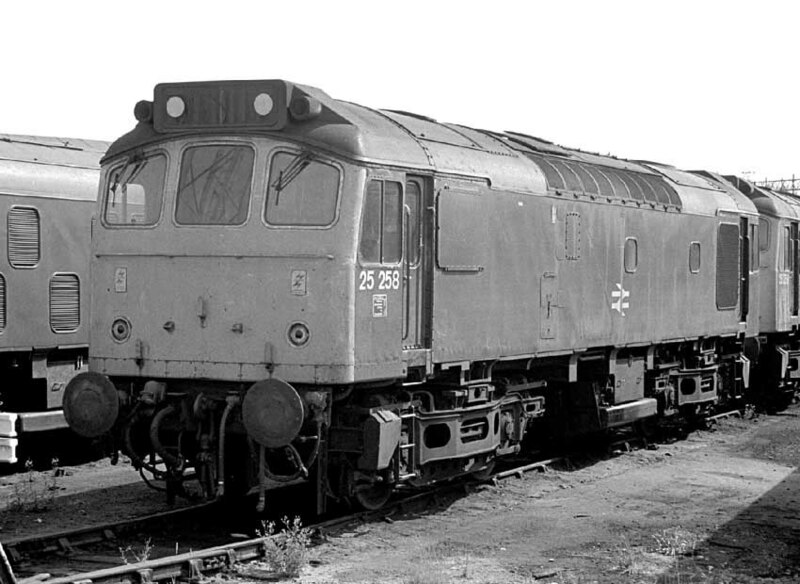 D7608 was part of a batch of thirteen (7598 - 7610) Derby built locomotives destined for Tinsley (41A). The frames were laid down during February with delivery occurring during April. D7608 moved to Barrow Hill (41E) during June and by the end of the year it had been transferred to Haymarket (64B). On July 9th D7608 worked a Sheffield - Chinley service. After thirty months operating on the Scottish Region 7608 transferred to the Nottingham Division (D16) in June. On September 9th 7608 & 5235 worked the 14.30 Yarmouth - Walsall from Norwich. On July 14th 7608 & 5226 were noted with the return Llandudno Town - Nottingham, it's presumed they also worked the westbound leg. Shades of the future were witnessed in the arrival of Class 31 5522 during August at Cricklewood, being transferred in from York. This was the first of the class to be permanently allocated to the LMR. With more Class 31s due to arrive the Class 25s were intended for Scotland, releasing Class 37s to the ER. Concurrently Doncaster was beginning a program to fit electric train heating equipment to the Class 31s, with 5521 being the first. As if in protest on August 2nd a morning Peterborough - Kings Cross service was worked through out by 5190 & 7608. The 08.09 Leeds - Paignton with 47128 was piloted as far as Sheffield by 25258 on July 6th. On August 3rd the 07.35 Nottingham - Llandudno Town and the return 13.00 Llandudno Town - Nottingham were hauled by 25258. Two weeks later on August 18th a Leicester - Skegness roundtrip was worked by 25258 & 25038. On June 21st 25258 & 31144 worked the Derby - Norwich - Yarmouth - Norwich - Walsall diagram. The 08.00 Walsall - Yarmouth to Norwich and the return 14.15 Yarmouth - Derby from Norwich on July 12th was worked by 25258 & 25136. On October 4th the 10.23 Derby - Matlock was worked by 25258. The 07.35 Nottingham - Llandudno Town and the return 13.00 Llandudno Town - Nottingham were worked by 25258 on June 19th. On September 3rd 25258 worked the 11.05 Cardiff - Taunton. A week later on September 11th the 09.49 Nottingham - Paignton was worked throughout by 25258 & 25218, a total of 261 passenger miles. The locomotives returned north with the empty coaching stock as the 5Z97 17.45 Newton Abbot - Sheffield (see image below). 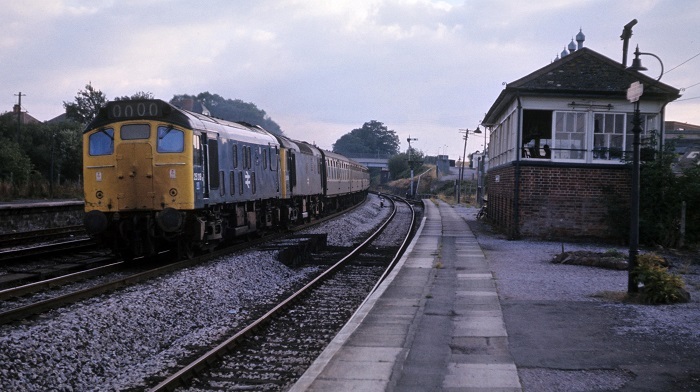 Photograph courtesy Bernard Mills 25218 & 25258 lead a Newton Abbot - Sheffield empty coaching stock working through Tiverton Junction on the evening of September 11th 1976. 25258 was present at Derby Works during March & April for its last classified repair. 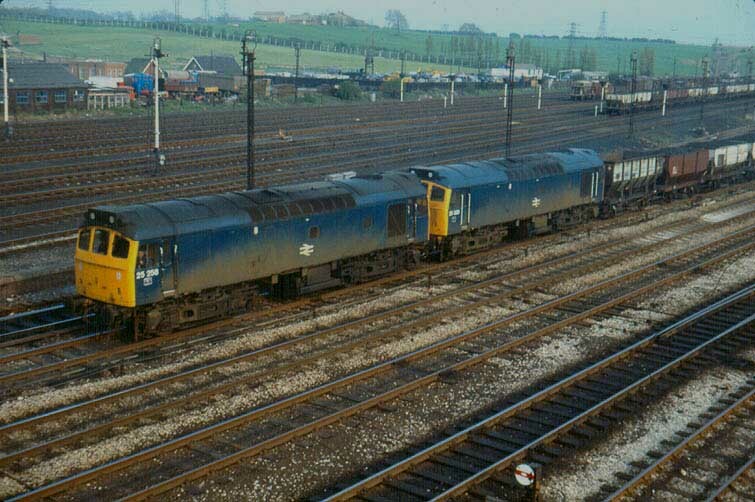 Its May 10th 1978 as 25258 & 25320 pull a long train of hoppers northwards from Toton. On June 17th the 09.19 Manchester Piccadilly - Yarmouth was worked to Lincoln Central by 25258 & 25264, with the return 09.15 Yarmouth - Manchester Piccadilly worked forward from Lincoln Central. The next day (18th) the same pair worked a Derby - Skegness roundtrip. A week later on July 27th 25258 worked the 17.10 Cardiff - Crewe. Trouble on December 16th involved a return Mountsorrell – Radlett working which became derailed on leaving Radlett in charge of 25258 & 31299, the slow lines being blocked for seven hours. A test train of Laboratory coaches, APT vehicles and an HST trailer was worked from Derby via Reading to Exeter on March 12th by a Class 47 but came back to Derby behind 25258 & 25311. The last E exam for 25258 took place at Springs Branch during September. 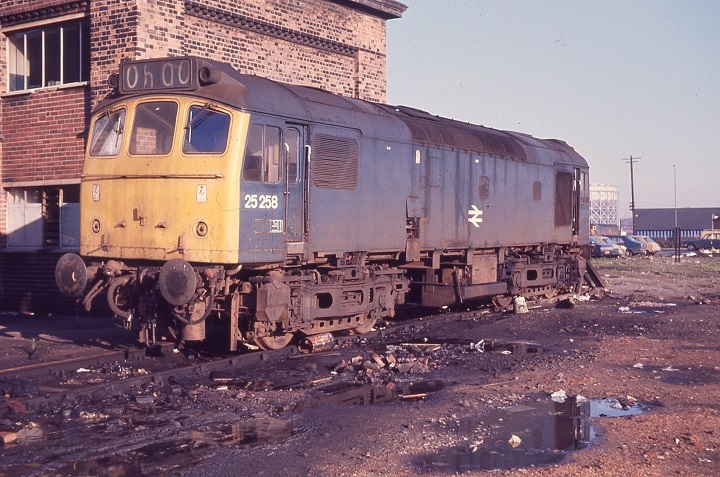 25258 was present at Derby works for N4 repairs from December 1979 to February 1980. On July 5th 25258 & 25254 worked the 08.02 Walsall - Yarmouth to Norwich and the return 14.15 Yarmouth - Derby from Norwich. The next day (6th) the same pair worked a Leicester - Skegness roundtrip. On July 9th 25258 was stabled at Speke Junction. On July 26th the 08.30 Glasgow Central - Blackpool North was worked to Carlisle by 25258 & 25300, the same pair then worked the return 15.05 Blackpool North - Glasgow Central forward from Carlisle. 25258 was noted at Derby Works for an N6 repair during November. A diesel multiple unit failure on June 24th saw the 16.37 Derby - Crewe and the return 18.30 Crewe - Lincoln Central to Derby worked by 25258. 25256 moved to Crewe during July, bring 25256 - 25258 together for one last time. On August 30th 25258 was noted northbound at York Holgate with empty steel flats. On December 14th 25258 & 25256 were in charge of a Stanlow - Bishopbriggs block oil train. A late afternoon Euston - Northampton service on December 20th was assisted by 25258 throughout due to the power being off because of overhead line damage. On May 13th 25258 was noted on the Tunstead - Northwich workings. 25258 & 25288 came to the assistance of 86222 in the late evening of May 26th after the Euston – Manchester was targeted by vandals, the driver requiring assistance from an ambulance crew. The Type 2’s were replaced at Rugby by another electric locomotive. The next day (27th) the 15.55 Carlisle - Euston was assisted between Preston & Crewe by 25258 & 25059, due to engineering work requiring a diversion. On May 31st 25258 & 25251 were noted northbound through Crewe with a block sand train. On August 3rd the 14.00 Scarborough - Liverpool with 45119 failed at Stalybridge, 25258 assisted the service to Manchester Victoria. On August 7th 25258 was noted hauling 08374 & 40022 through Guide Bridge en-route from Ashburys to Doncaster Works for scrapping. The next day (8th) 25258 was noted passing through Bescot with an engineer's train. On August 20th 25258 & 25211 were noted on the evening Severn Tunnel Junction - Whitemore speedlink service. The 17.20 Manchester Piccadilly - Hull was worked to Sheffield by 25258 on November 18th, 31452 worked the train forward. Photograph courtesy Tony Sayer. A simple portrait of 25258 at Cockshute on November 12th 1984. The locomotive has about five weeks left in service. 25258 was withdrawn on December 21st 1984.